Who doesn't want hi-tech presents for the holidays? Everyone I know does -- that's why I put up my hi-tech holiday gift guide a few days ago. 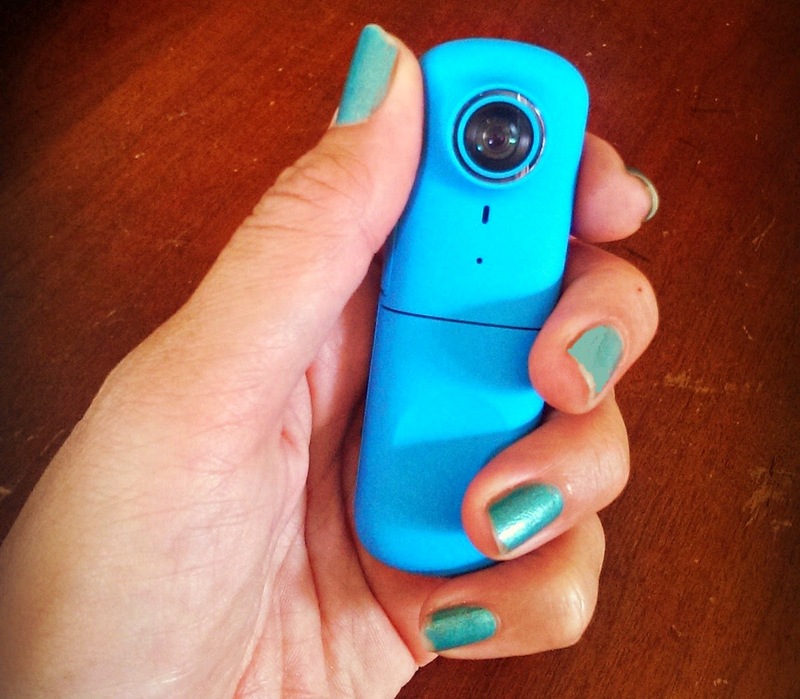 One of the items on my guide was Logitech's Bemo social video camera -- I even had a giveaway for the camera! That giveaway is over, but you still get a chance to win a little more holiday cheer... through Logitech's new holiday scratcher promo! 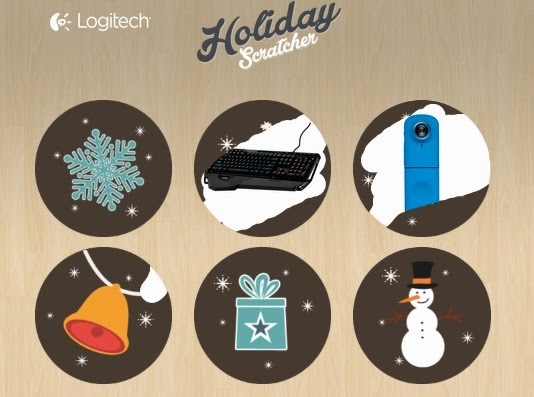 Logitech's digital “holiday scratcher,” is a great opportunity to win that perfect holiday gift from Logitech. Products include Bemo, Logitech Bluetooth Multi-Device Keyboard K480, Logitech Keys-To-Go, Logitech Wireless Mouse M325 (Color Collection) and more. Take it from me, you definitely want to win these: the wireless mouse is one of my favorite laptop accessories, and the Bemo is so much fun to use! To enter, all you have to do is go to the holiday scratcher app on their Facebook page, and use a mouse (or your finger on a touchscreen device) to scratch away 3 circles. If the images behind the 3 circles match, you win the item pictured in the images! You get 3 chances every day, and you can earn more entries by sharing the promo with friends. 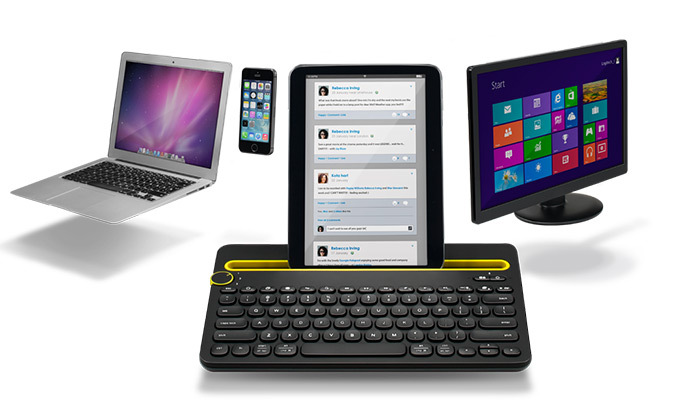 BUT WAIT..... you get another chance to win two of Logitech's hi-tech goodies right here!! This giveaway ends at 11:59 PST on Dec 15, 2014. I will draw a winner at random on Dec 16 and post their name after they confirm acceptance. Continental US residents only. For additional giveaway rules, click here. Disclosure: Giveaway prize provided by Logitech. The views and opinions expressed here are my own. 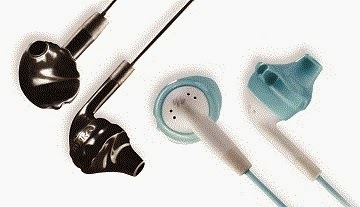 Yurbuds ($20-$50) -- big sound, small price! 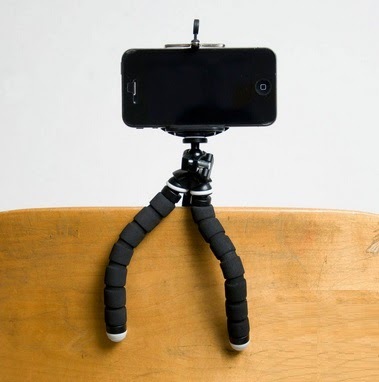 iStabilizer Flex tripod ($29.95) -- for better selfies! 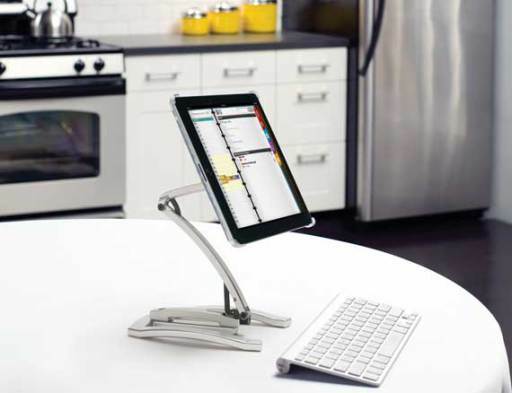 Sanus VTM1 iPad mount ($70) -- hands-free, fuss free reading at the breakfast table or while cooking! 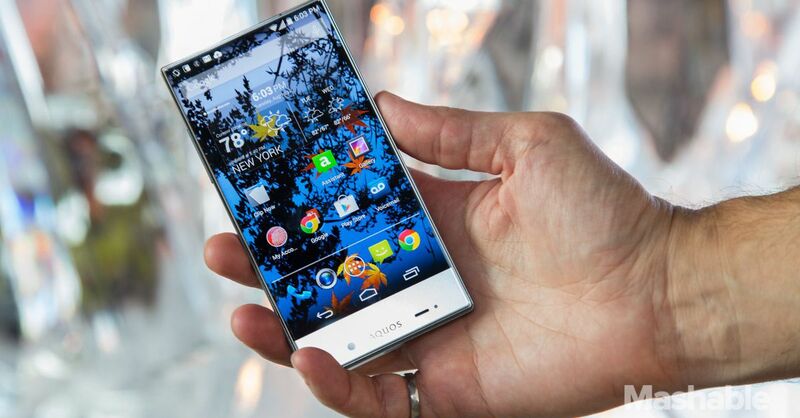 Sharp Aquos Crystal phone ($135) -- it looks and feels like a high-end phone but only costs $135! Bemo social video camera ($129) -- fuss free, spur-of-the-moment video recording! 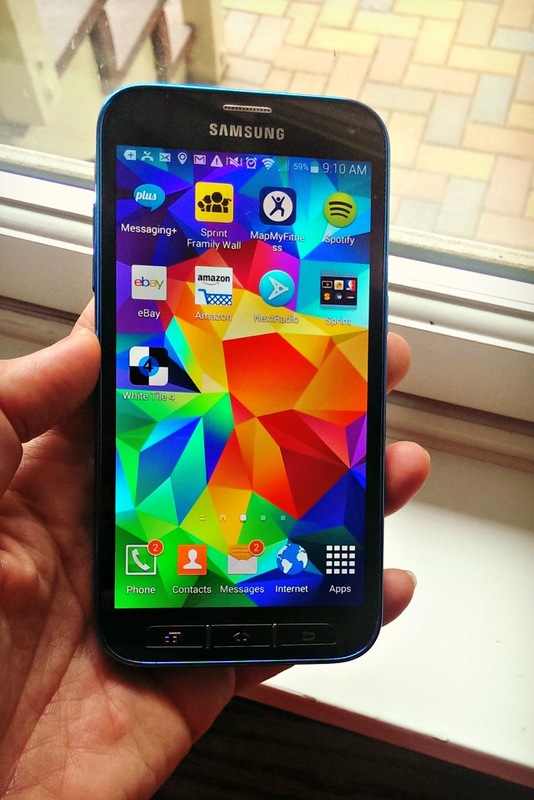 Samsung Galaxy S5 ($500+ without contract)-- iPhone 6 plus? Seriously, who needs it when you have the S5? 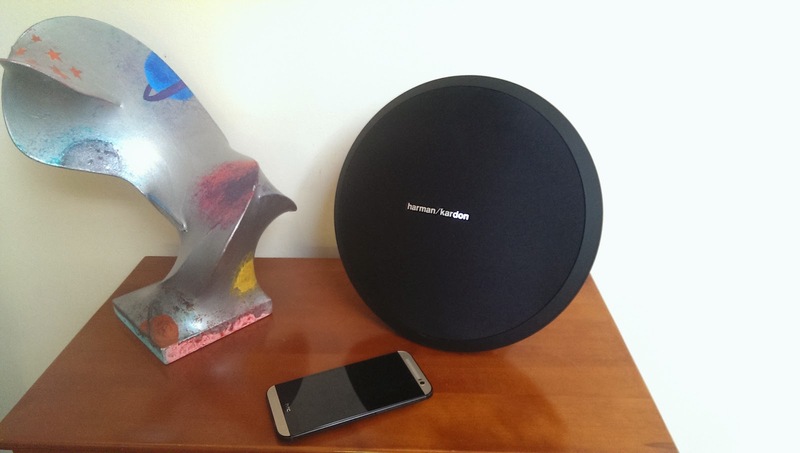 Harman Kardon Onyx Studio wireless speakers ($599) -- small homes can ditch the home speaker system in favor of the Onyx Studio and a smartphone! 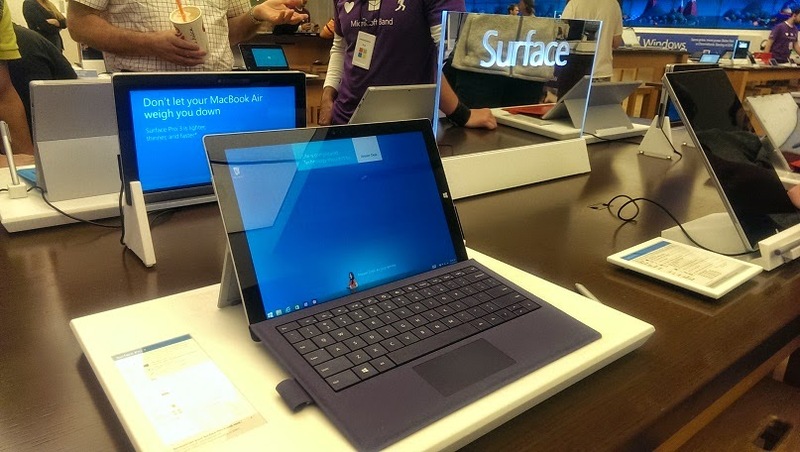 Microsoft Surface Pro 3 ($799) -- everything I love about the iPad, plus a USB port! The holiday travel season is fast approaching! The roads will be full of people on their way to parties or to grandma's house, and with winter weather blanketing most of the country, staying safe on the road can be challenging. As if decorating the house, wrapping presents, and planning parties isn't stressful enough! To help make everyone's life easier, Safety 1st consumer safety experts have come up with some great safety tips! One lucky Bonggamom Finds reader will receive a Advance SE 65 Air+ convertible car seat from Safety 1st! This premium car seat has the latest in impact protection technology to keep your little one safer on the road. Leave a comment on this post and share a tip to keep your family safe and happy during the holiday season. This giveaway ends at 11:59 PST on December 7, 2014. I will draw a winner at random on December 8 and post their name after they confirm acceptance. Prize shown in the photo is the St. Germain fabric pattern; actual fabric pattern may vary .Continental US residents only. For additional giveaway rules, click here. Disclosure: I did not receive a sample or monetary compensation for this post. Tips and giveaway prize are provided by Safety 1st. The views and opinions expressed here are my own. You want your home to look gorgeous for the holidays, but unless you're Martha Stewart, it can be intimidating to decide on a great holiday look, and it can be even harder to make everything look as good as it does in your head. Luckily for Bay Area folks, the Balsam Hill showroom is now open for the holidays! 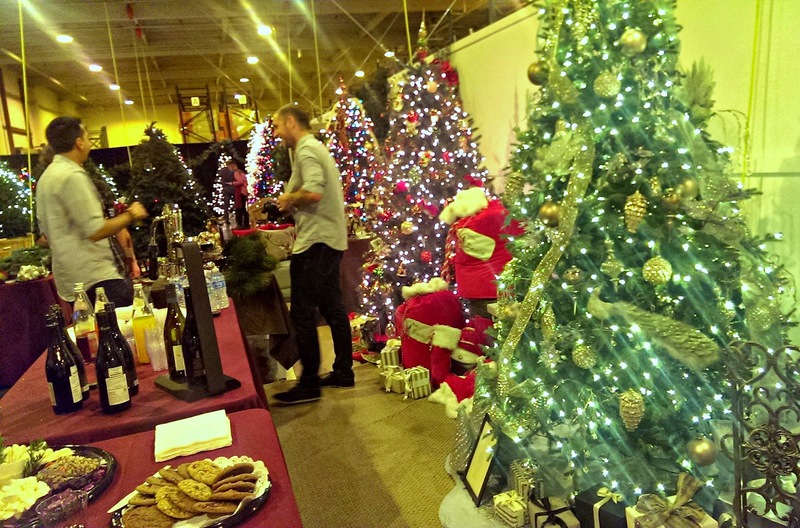 Located in Millbrae, customers can gaze at dozens of beautiful Balsam Hill trees, all done up for the holidays, to get ideas and inspiration. Last week, Balsam Hill invited me and a group of bloggers to attend the showroom opening. Everything looked so beautiful -- their trees and wreaths and garlands are so lush and thick, and each one was decorated in its own unique style. Balsam Hill also sells decorations, so everything you need to decorate your home is right here. The main event for the evening was a wreath decorating contest. 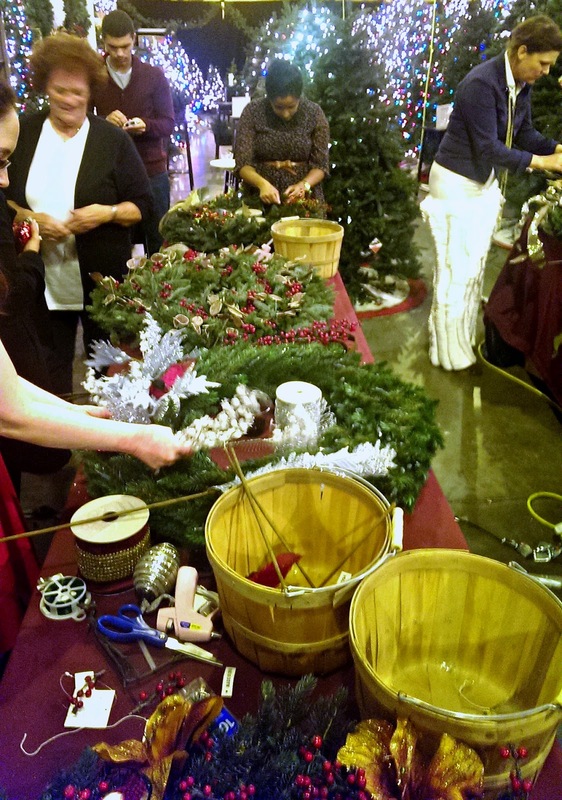 Balsam Hill provided eight contestants with a beautiful Balsam Hill wreath, wire, scissors, glue gun, and glue. We were allowed to pick anything we wanted from an assortment of leaves, berries, bows, ribbons, ornaments, and all kinds of beautiful things to decorate our wreaths. Just like the design challenges on the Food Network, we were given 30 minutes to decorate our wreaths, then each of us presented our wreaths to a team of judges, who decided on a winner. It was so much fun! I've never really decorated a wreath before (tying a red ribbon on a wreath does NOT count! ), but luckily I love crafting. Also, I had my secret weapon: two awesome helpers, 3Po and Jammy. We decided on a red and gold theme. We scattered red holly berries around the wreath and added five golden flower accents, one for each member in the family. 3Po added five red robins to the wreath, also to represent each one of us -- he even put two robins together in the center to symbolize Alfie and me! Jammy made a big gold ribbon in the center and glued a glittery Santa Claus ornament in the center of the bow. We worked right up to the last second, but we managed to finish... and it looked fantastic! The boys were so proud of their creation and so pumped that they had participated in the kind of challenge that we love to watch on TV. While waiting for the judges to decide on the winner, we were given a demonstration of Balsam Hill's amazing Flip Tree. 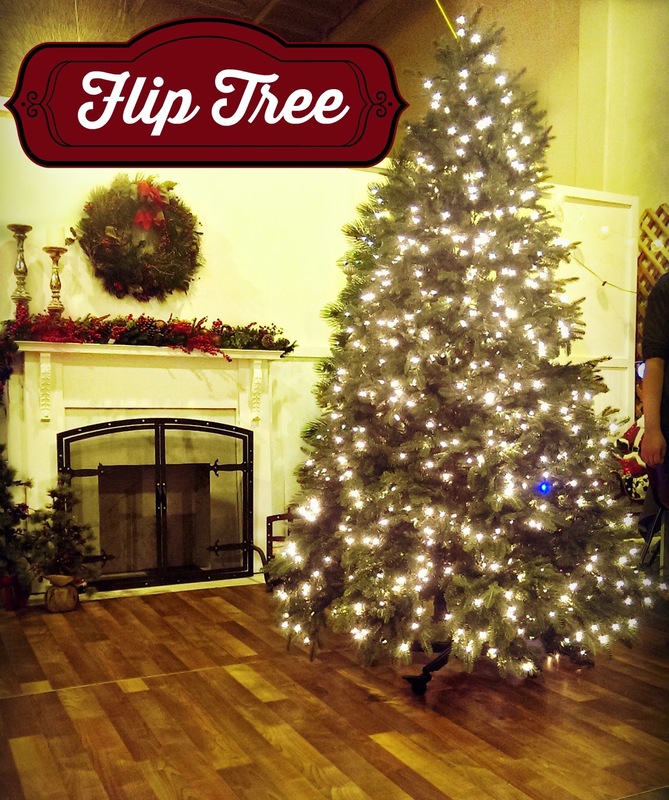 The Flip Tree is so easy to assemble -- just roll it to where you want it, flip it over, and attach the tree topper! It's pre-lit, so you don't even have to worry about stringing lights. 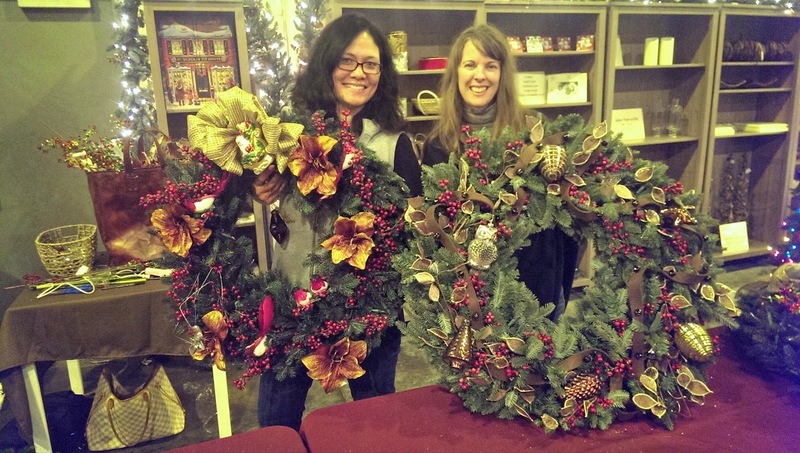 Here I am with my friend Cam, posing with our wreaths. Cam delegated the decorating of her wreath to her mother, and her wreath was so GORGEOUS that I was sure she would win first prize. I was right!! 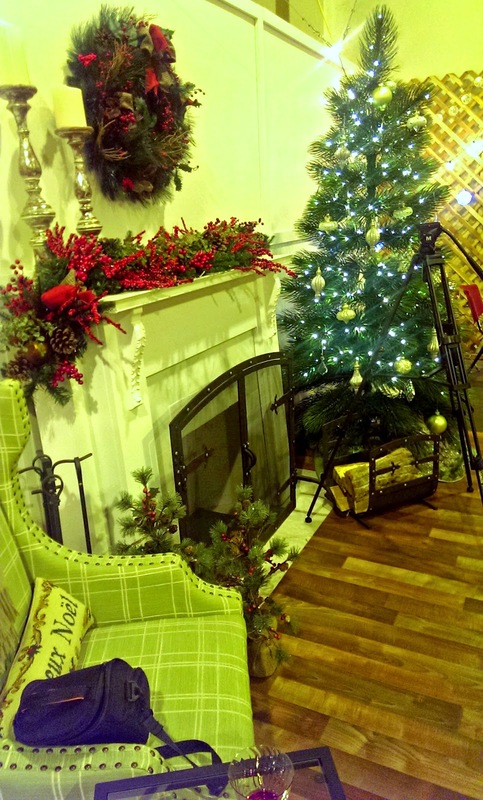 For winning the contest, she received a beautiful Balsam Hill 7-foot holiday tree! She is so lucky, because Balsam Hill holiday trees look just like real trees, without the fire hazard and the stress of having to water it and sweep up fallen needles. The only thing you'll miss is the fresh pine smell -- but guess what, Balsam Hill sells scented ornaments ("scentsicles") will fill your home with a natural pine scent. We're not at all bummed out that we didn't win (although Jammy whispered confidentially to me, "I'm SO proud of our work!! Even though we didn't win, I think ours stood a pretty good chance!"). We had a great time. 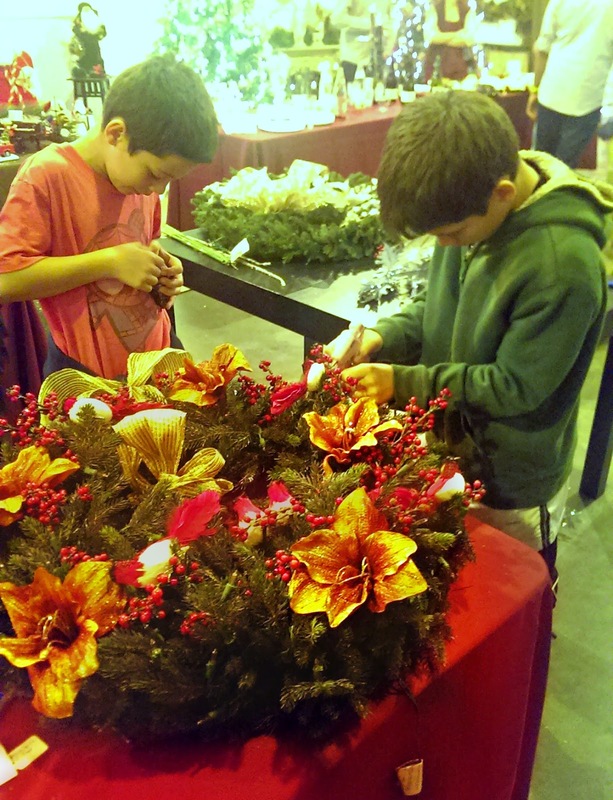 I never realized what a fun family activity wreath decorating can be! You can get individual wreaths for everyone and make it into a contest, or you can all work together on one wreath. If you use wire instead of hot glue to secure your decor to the wreath, you can dismantle it after the holidays are over, and reuse the wreath every year! If you have a sturdy, high-quality wreath, like the Balsam Hill, you'll be able to enjoy it for many years to come. 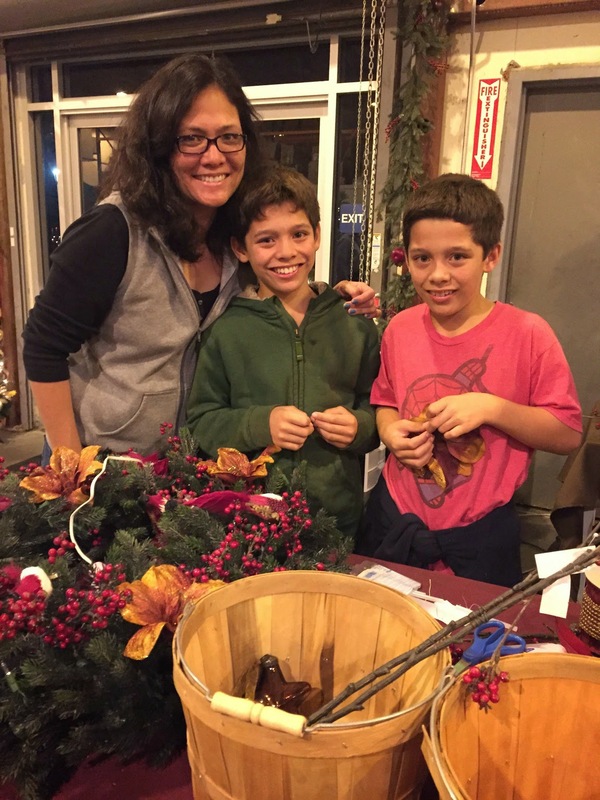 Thanks, Balsam Hill, for introducing us to a new holiday tradition! 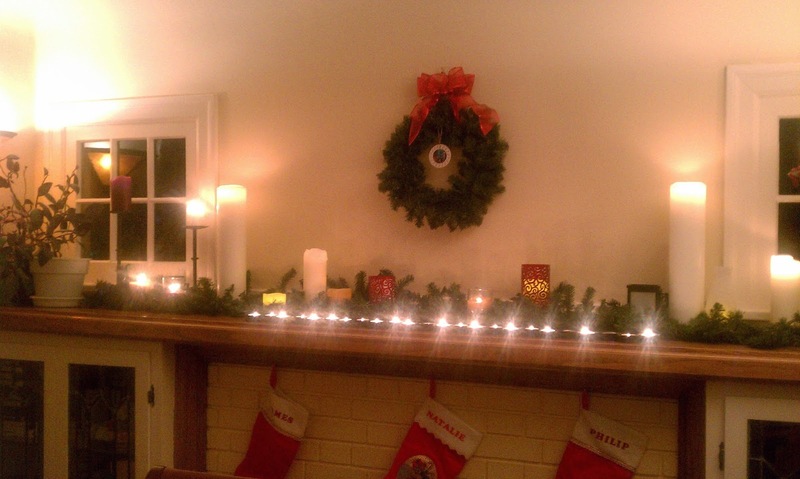 Disclosure: I was invited to a blogger event and received a wreath and ornaments to take home. The views and opinions expressed here are my own. The number of grey hairs sprouting on my head seems to be multiplying exponentially by the month! I'm not getting any younger, and I'm not too proud to admit that I'm vain enough to want to get rid of the grey. I used to pluck the grey hairs from my head, but unless I want to go bald, that's not going to work any more! The thought of spending hundreds at a beauty salon for a good coloring job isn't my style, but I don't want to be the crazy lady who everyone can see colors her hair because she does such an awful job at it. When Madison Reed invited me to try their salon quality hair color, I was a bit reluctant, but decided to give it a shot. They're a San Francisco startup with deep roots (pun intended!) in the styling industry, and they're make waves (again, pun intended!) in the Bay Area, so why not? My trust was well founded -- I've discovered that Madison Reed is definitely not your everyday, run-of-the-mill, DIY drugstore hair color. Madison Reed makes it so easy to select a color that works for you. Through their Color Advisor, Color Translator or mobile app, you get asked a series of questions about your current hair type and color, then you get suggestions on colors to order. You can place a recurring order (which saves you the most money) or order a single hair color kit. Your hair color kit is delivered straight to your home. Everything you need to get beautiful, even color is right in the box -- not just the coloring and the applicator bottle, but also two sets of disposable gloves, some cream to prevent your skin from staining, cleansing towelettes, and small bottles of shampoo and conditioner to keep your new haircolor looking its best. Here's my before photo. 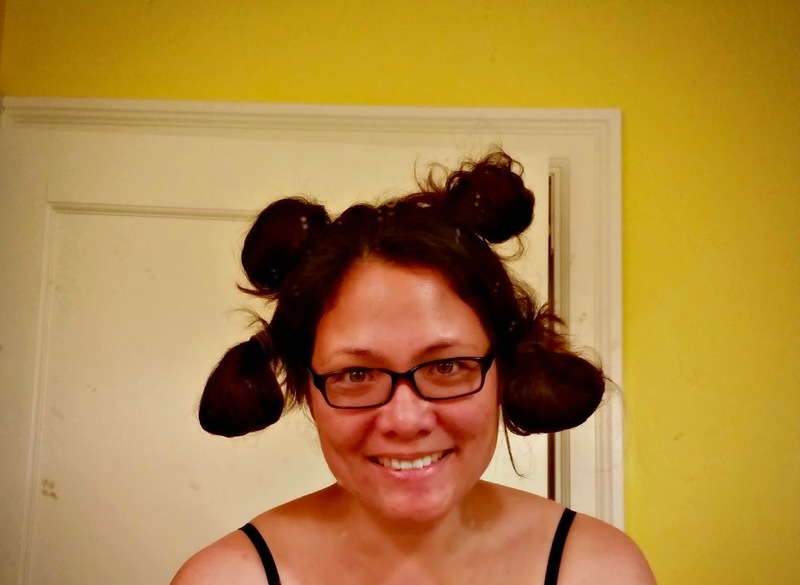 I've parted my hair into four sections, as instructed, so I can get at the roots more easily. Here I am, beginning to apply the coloring. The instructions and illustrations on the box make everything easy as pie. I love the fact that Madison Reed hair color doesn't smell like chemicals or dyes! It hardly smells at all -- if anything, it smells like a mild, lavender-scented lotion. That's because Madison Reed hair color is PPD, resorcinol, ammonia, and paraben free. That cream you see on my forehead above? It looks funny, but it's really useful. 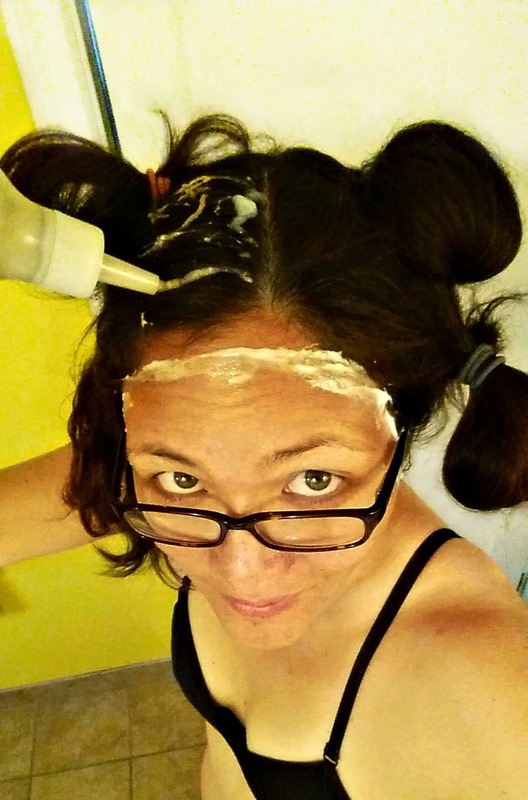 You apply it all around your hairline to keep the coloring from staining your skin. You can see in the photo below that some of the cream got smudged away, and there's a big, brown color stain on the corner of my forehead. Fortunately, Madison Reed also provided a cleansing towelette to help me wipe away some of that stain. 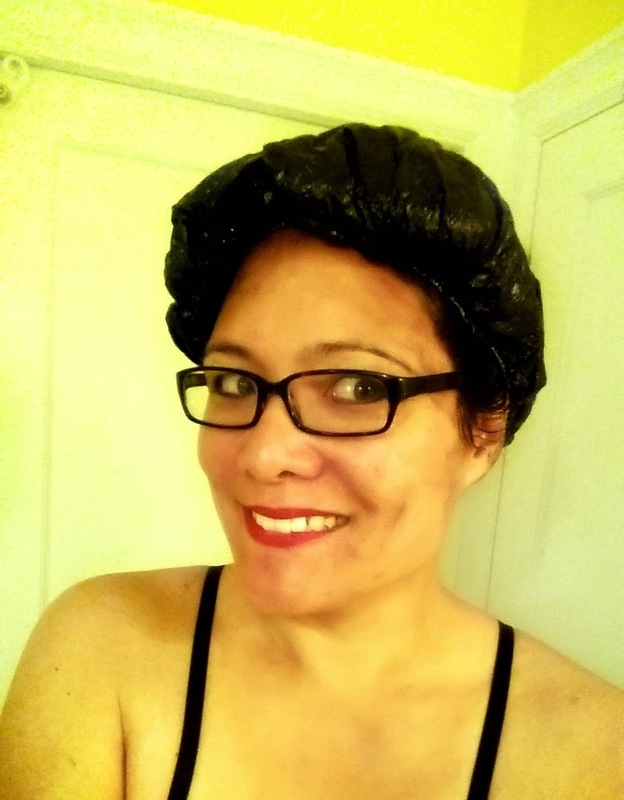 Here I am with my shower cap on, waiting for the color to set. 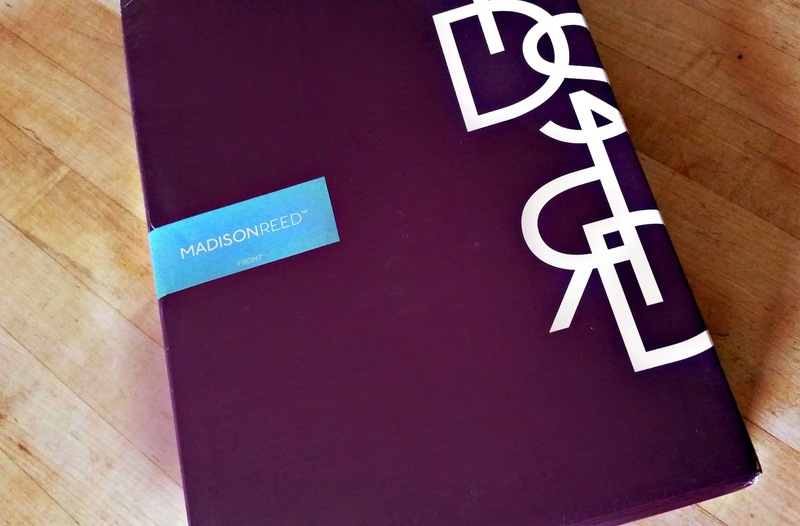 Since Madison Reed doesn't use harsh chemicals in their products, your skin and scalp don't sting! Note: when the instructions say "Rinse until water runs clear", MAKE SURE YOU FOLLOW THEM! Even when you think you've rinsed all of the coloring out, rinse it for five more minutes.The bathrobe I wore while rinsing out the coloring did get stained pretty badly at the neckline, and my pillowcases have some stains as well. Washing them has not gotten the stains out, so I think I may have to bleach them out. Let's hope that works! Here's my "after" shot. It's hard to see the difference in the photo, but Madison Reed got rid of the grey! 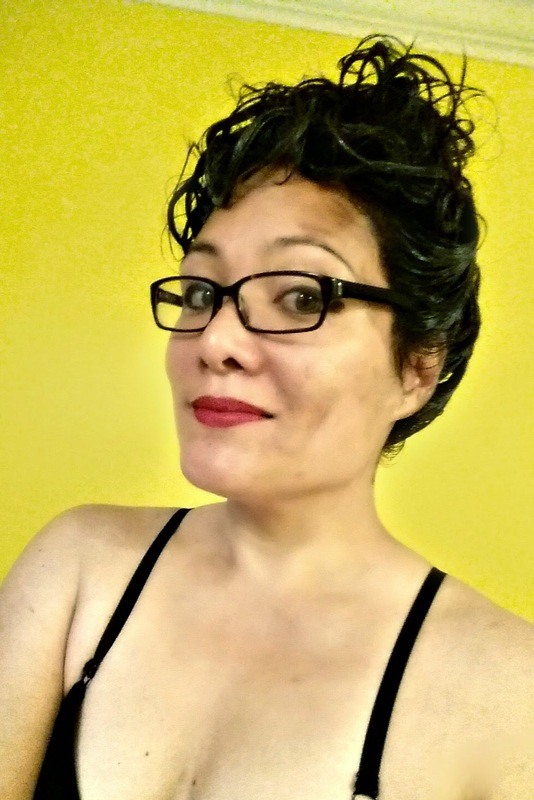 Venezia Brown turned out to be the perfect shade -- it was so close to my real hair color that not even my husband noticed that I had colored my hair! It's actually a bit lighter and a lot brighter, and I'm really happy with it. The coverage is nice and even, and my hair is so nice and shiny (and did I mention no grey?). Madison Reed is a great find, and I'm definitely using it again when my roots start to show! Music was playing in the delivery room when I delivered my kids. I wouldn't have been able to get through 27 hours of labor without it! Music can inspire us to get fit. 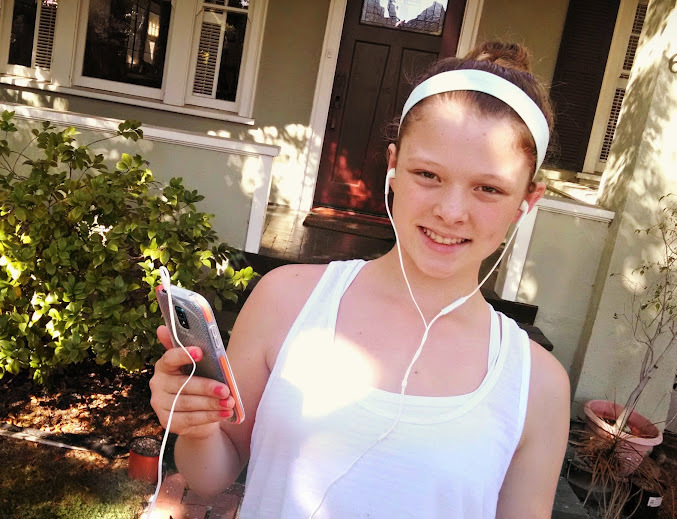 Running is my main form of exercise, and I wouldn't be able to run without music! It's the only thing that keeps me going on any run longer than 10 minutes! Music is what saw me through all of the half marathons I've ever run in my life. 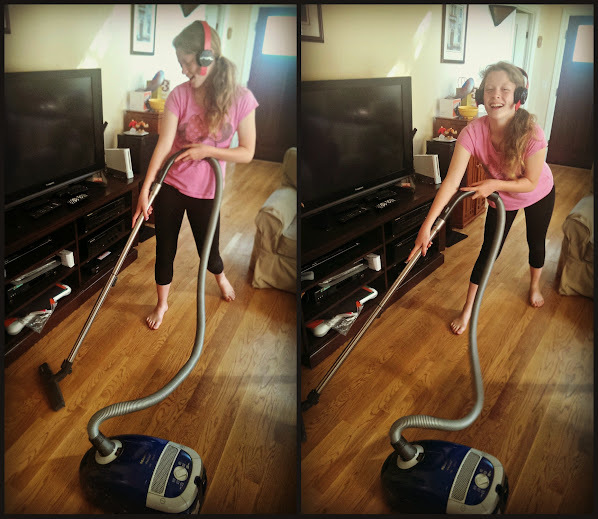 Music can even get my kids to do housework! What has music made YOU do? Share your story, and you could win an amazing SOL REPUBLIC prize pack! 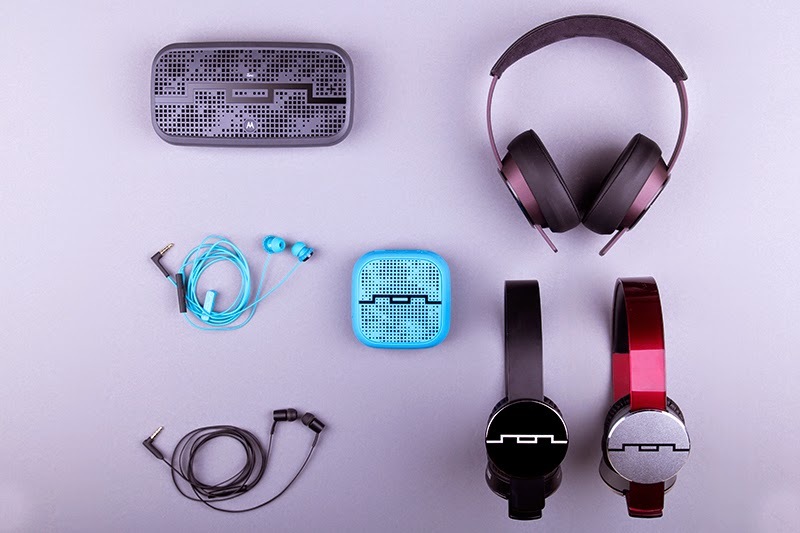 Win a SOL REPUBLIC Prize Pack! Leave a comment on this post and share a Music Made Me Do It story -- what crazy/sweet/unexpected things has music made you do? Please tag your comment with #MMDI. 10) Join any open giveaway on Bonggamom Finds (1 entry for every giveaway you join). The prize pack image found in this post is only an example. The products in the prize pack may vary from the colors shown in the image and will be sent based on availability. This giveaway ends at 11:59 PST on Dec 1, 2014. I will draw a winner at random on Dec 2 and post their name after they confirm acceptance. Continental US residents only. If you have won a SOL REPUBLIC giveaway in the past 6 months, you are eligible to win this giveaway. For additional giveaway rules, click here. Disclosure: I did not receive a sample or monetary compensation for this post. Prize pack is provided by SOL REPUBLIC. The views and opinions expressed here are my own. 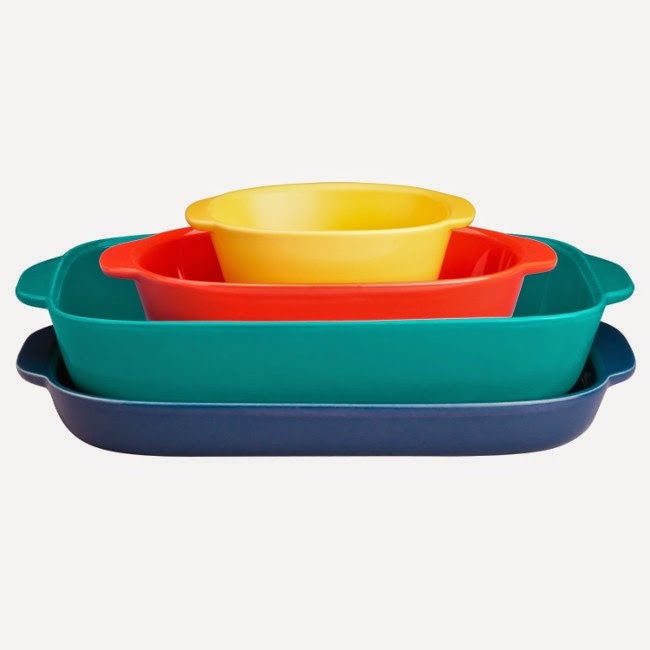 Corningware serves up festive colors and durability with this set of 4 stoneware dishes. They're great for casseroles, crumbles, hot appetizers, and anything you want to serve at your next party or potluck. 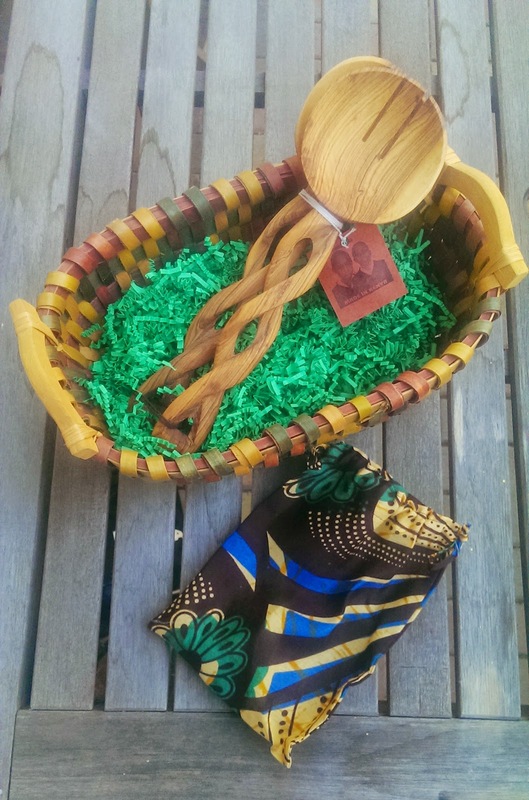 This gorgeous wooden serveware, doesn't just help serve salad, it helps orphans in Kenya. You can get them from the World Vision Gift Catalog, or you can enter to win a set on Bonggamom Finds! 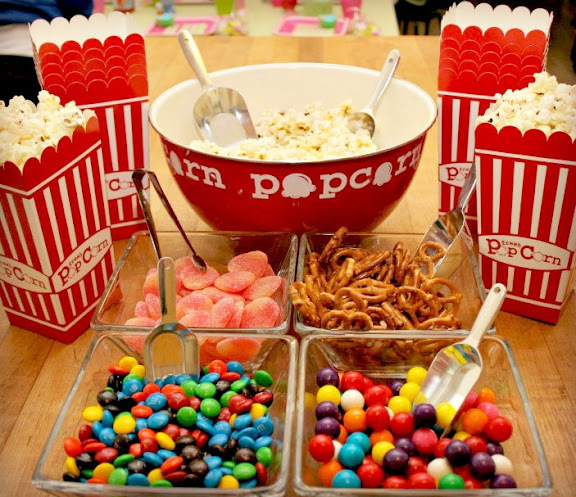 Have a a popcorn and candy bar at your holiday gathering! 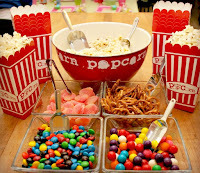 This metal popcorn bowl, available at Cost Plus World Market, leaves no doubt about what's inside. 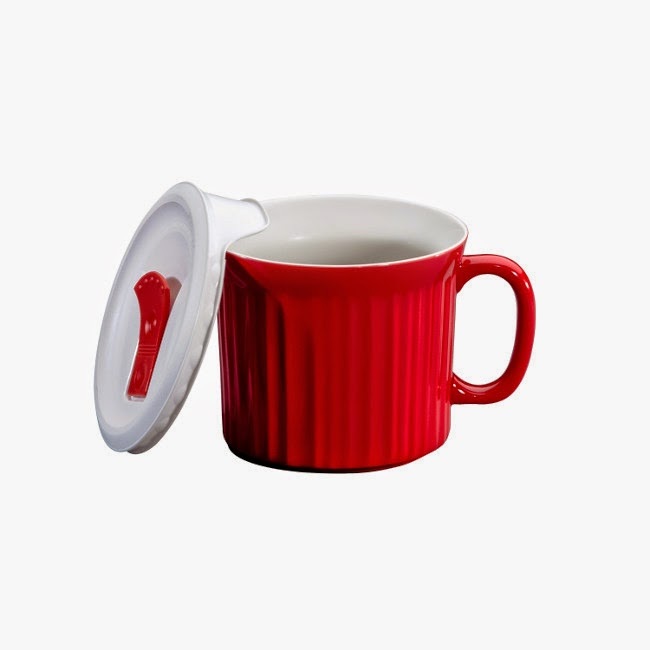 Plus, the red color with match with any holiday decor. The kids' table doesn't have to look like an afterthought. Take it out of the corner and bring it into the spotlight with a gorgeous red tablecloth with the just the right touch of childish whimsy. $1000 Black Friday Holiday Giveaway!